6 genera, 20 species; See text. The Somniosidae are a family of sharks in the order Squaliformes, commonly known as sleeper sharks. 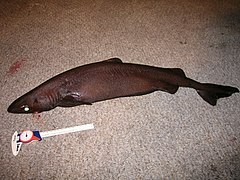 The common name "sleeper shark" comes from their slow swimming, low activity level, and perceived non-aggressive nature. Beaks recovered from the stomachs of sleeper sharks suggest that these sharks feed on giant squid and colossal squid. This makes sleeper sharks the second known animal that preys on these squid, alongside the sperm whale. Greenland sharks of the family Somniosidae are hunted for food in Iceland. In modern times, many Greenlandic sharks used for hákarl production are purchased from fishing ships where the sharks were trapped in the fishing nets. The shark carcass is traditionally fermented in a shallow pit, with stones placed on top of the shark, allowing poisonous internal fluids, like urea and trimethylamine oxide, to be pressed and drained out of the body. The meat is then cured for several months, rendering it safe for human consumption. ^ Froese, Rainer, and Daniel Pauly, eds. (2011). "Somniosidae" in FishBase. February 2011 version. ^ Erin McCarthy (December 18, 2014). "7 Cool Facts About Greenland Sharks". MentalFloss.com. Retrieved August 17, 2016. ^ Bruce A. Wright (December 8, 2000). "Sleeper Sharks Not So Sleepy". Arctic Science Journeys, University of Alaska Fairbanks. Retrieved August 17, 2016. ^ "Family Somniosidae - Sleeper sharks". Fish Base. Retrieved 29 December 2012. ^ Cherel, Y. & G. Duhamel 2004. "Antarctic jaws: cephalopod prey of sharks in Kerguelen waters" (PDF). [permanent dead link] (531 KB) Deep-Sea Research Part I 51: 17–31. ^ Wheatley, Gale (20 September 2010). "Iceland's Wild Culinary Traditions: Hákarl and Brennivín".